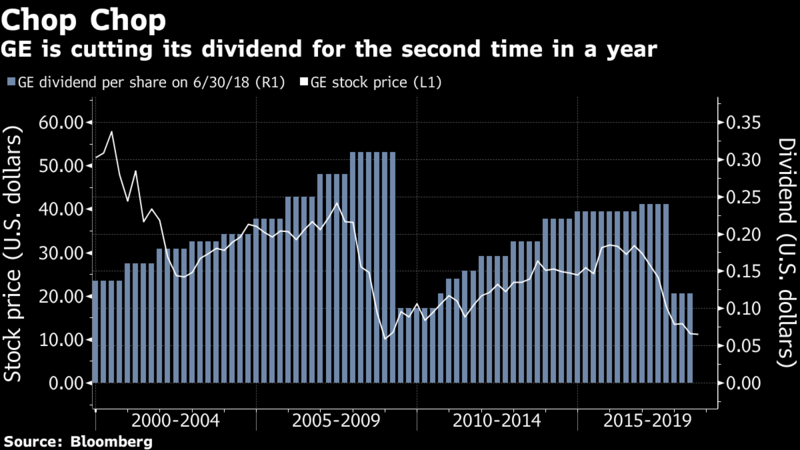 GE cut its quarterly dividend from 12 cents a share -- only the third reduction since the Great Depression -- which will save GE about US$3.9 billion a year. The announcements mark Culp’s first moves to turn the company around. He has yet to address shareholders since the board’s surprise Oct. 1 decision to oust CEO John Flannery, making Tuesday’s pronouncements highly anticipated. For power, GE plans to create two units: a unified business combining GE’s gas product and services groups; and a second operation with the portfolio of GE Power’s other assets, including steam, grid solutions, nuclear and power conversion. GE Power has been a main source of the company’s troubles and reported a 33 percent decline in third-quarter sales. It’s not all bad for the beleaguered manufacturer. Sales climbed 12 percent in GE Aviation, which is boosting production on a new engine for narrow-body commercial jets. The shares rose 1.3 per cent to US$11.30 in New York premarket trading. GE plunged 36 per cent this year through Monday as the Standard & Poor’s 500 Index slid just 1.2 per cent. Culp’s appointment sparked a mini-rally earlier this month, but that fizzled recently amid renewed questions about the power and finance businesses. The shares closed Monday below the US$11.29 closing price of Sept. 28, the last trading day before the CEO change.